This is a meal in one bowl – it’s both hearty and comforting and it’s hard not to like lentils. It’s up to you whether you cook another sausage or two to use as garnish. Blend the carrot, onion, celery and leaves, garlic, coriander seeds, parsley and sausage meat in a food processor. Heat some olive oil in a pot and add the speck and cook for 2-3 minutes. Add the blended vegetable and sausage mix. Cook for about 10-15 minutes to soften the veges. Add the white wine and let it boil until it reduces by about half or more. Add the lentils, bay leaves and 4 cups of stock. Bring to the boil then turn the heat down, cover and leave it to simmer until the lentils are soft. You’ll probably need to add more stock (or use water) as it cooks depending on how soupy or thick you’d like it. Add the silverbeet and cook for another five minutes. 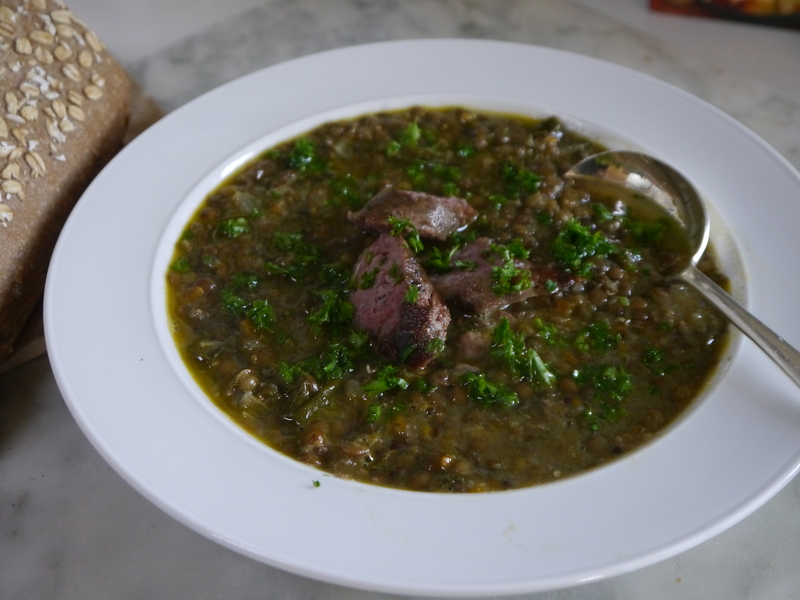 Serve in large bowls sprinkled with more parsley and extra sausage slices if using.